CitiesBeautiful.org researched differences based on gender, age, education, language spoken, countries visited, etc. Statistically significant variations arise for many of these factors – with important implications for tourists, the travel industry, and other professions. (TRAVPR.COM) UNITED STATES - October 17th, 2017 - CitiesBeautiful.org (http://citiesbeautiful.org/) is a website dedicated to providing people everywhere a broadened and deeper understanding of civic beauty. A key feature of the website is a Civic Beauty Rankings test (CBR) – a psychometric questionnaire somewhat like a Myers Briggs personality assessment test – with which website visitors can determine the types of urban places they will find most beautiful. With their test results, visitors then can take customized, interactive map tours of hundreds of beautiful places in cities on six continents. 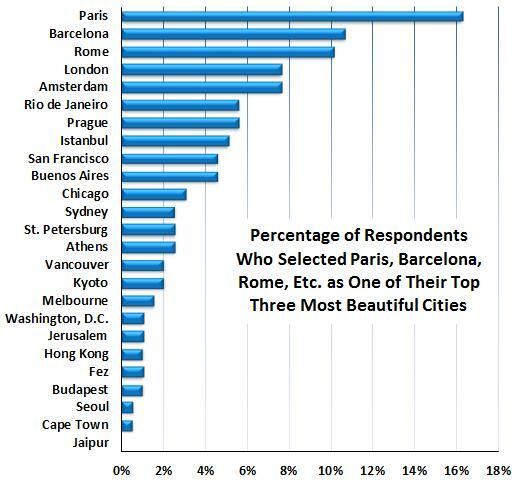 The CBR, among various other questions, asks that respondents choose the three cities they find most beautiful from among 25 cities worldwide. The CBR also solicits basic demographic information – gender, age, education, etc. 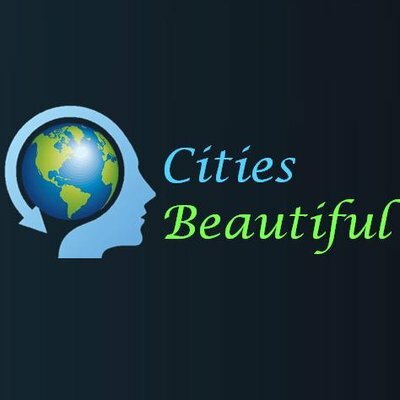 With this survey information, CitiesBeautiful.org has conducted numerous statistical analyses on whether the perceptions of beautiful cities of people around the world differ based on their demographics. Statistically significant differences DO arise among 12 traits investigated, some of them surprising and all of them interesting. The results have important implications for tourists, the travel industry, government agencies that promote tourism, and various other disciplines (city planning, architecture, behavioral science, and so on). The results of the demographic analyses are now available in an article entitled “Demographic Differences in Perceptions of Beautiful Cities”. The article can be read and downloaded, free of charge, at the CitiesBeautiful.org website. CitiesBeautiful.org promotes the appreciation of cities around the world. 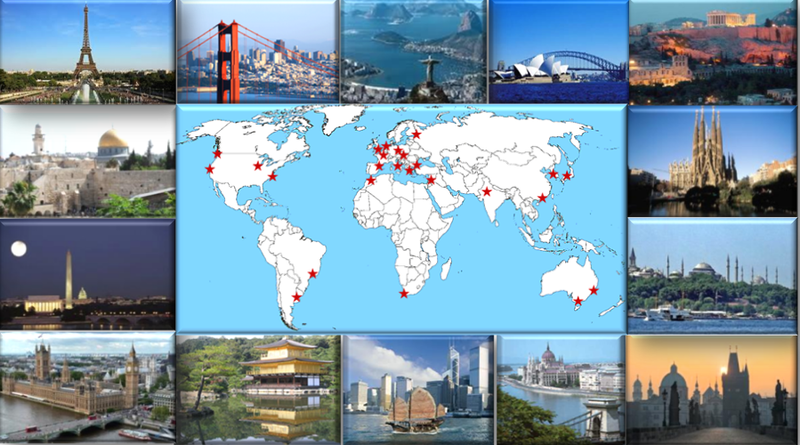 Website visitors learn a 15 term vocabulary describing beautiful urban places, collectively known as “Beautiful Facets”. The 15 Beautiful Facets derive from common threads in the theories on beauty put forth by famous commentators from Ancient Greek times to the present. Since “beauty is in the eye of the beholder”, everyone has favorites among the 15 Beautiful Facets. 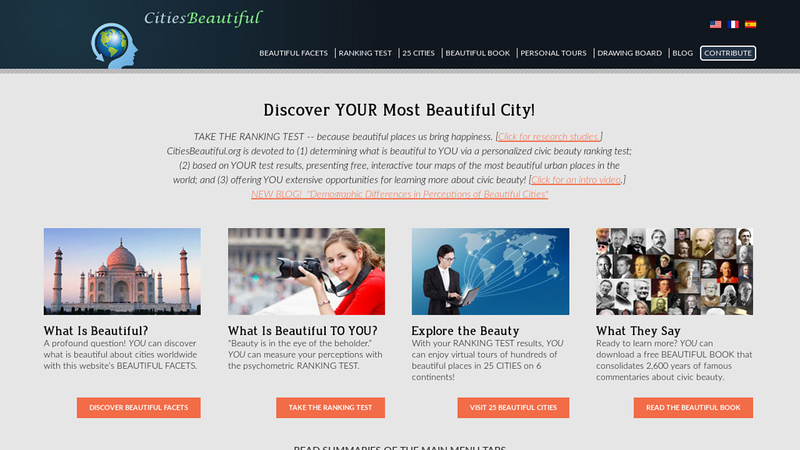 Website visitors can determine their favorite Beautiful Facets by answering a series of multiple-choice psychometric questions – the Civic Beauty Ranking test (CBR) referenced above. Once visitors establish their preferences from among the Beautiful Facets, CitiesBeautiful.org provides customized tours of 1,800 urban sites worldwide that have all been categorized by the 15 Beautiful Facets. The CitiesBeautiful.org website contains a considerable amount of additional information. For example, see the website’s “Beautiful Book” tab for a free e-book containing brief biographies on 40 of the most important aesthetic philosophers, architects, city planners, and behavioral psychologists over the last 2,600 years; a thorough explanation of each the 15 Beautiful Facets; a detailed explanation of the method used for calculating the Cities Beautiful Index (CBI) of each city; and much more!